A disclaimer: by no means do we think that you should follow our advice. However, as two people who managed to get ourselves from Tacoma, Washington to Winston-Salem, North Carolina in one piece (with a still working car! ), we thought we'd let you in on what that sort of looked like. Maybe you're thinking of trying a similar road trip yourself, maybe you're looking for reasons to never do what we've done ever...? For the record, there are a million people on the road who have better, more equipped setups than we do. Our angle is that we're relatable (not underprepared)! We are two people who didn't know what we were doing, decided to try anyway, and kinda did it. Our sweet little Honda Element, which we bought via Craigslist for a good deal, was equipped with a bed, a cooler, a camp stove, some storage containers that were slightly too small for our usual amount of food and kitchenwares, a first-aid kit, our backpacks, and some undesirable toilet solutions for sticky situations. That's about it. This worked out, for the most part! Our version of road tripping was hardly a step above tent camping as far as luxuries, but you know, the 6 inch memory foam mattress was really nice. Our usual routine at the beginning of the week often involved going out of our way to find a Trader Joe's--our home away from home--because we are creepily obsessed with them, and because we know our way around any TJ's like the back of our hand. We can zip in and zip out with our favorite dried meats, soft cheeses, coffee, wine, breads, cereals, and snack items for less than $80 and in under half an hour. Then we play a game of Tetris as we try to fit everything in our little Stanley cooler (that is only slightly larger than a block of ice) and our dry bag, but in the end, we are probably good for the week. Andrew experiments with foil to reduce cleanup. In our kitchen kit, we had a two-burner gas stove, one pot with a lid, one skillet, a French press (that we quickly deemed too irritating to clean), a collapsable coffee pourover, two bowls that double as tupperware with lids, two plates, forks and spoons, a spatula, and a couple of pocket knives. Breakfast was frequently very buttery eggs and toast in the skillet, while the pot boiled water for coffee. We made oatmeal a couple of times, which always sounded good, but we immediately regretted it once we realized we couldn't make coffee at the same time. Plus cleanup--we relied heavily on paper towels for cleaning things, because large amounts of disposable water was not a guarantee. Lunch was often sandwiches, just a bit of meat and cheese on bread. Sometimes we splurged on apples to go with lunch. Dinner was usually some form of pasta, which used more water than was probably necessary, but I was super over the hot dog life within the first week--not sustainable. And though we were technically "roughing it," we allowed ourselves a few indulgences like dessert and a little wine. It is our honeymoon, after all. 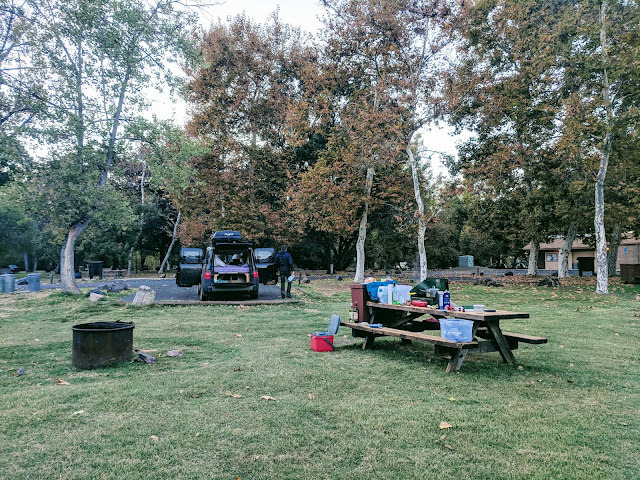 Before the trip began, we envisioned a little more urban camping than we ended up actually doing, because it turned out we very much preferred the wilderness over parking lots. For one thing, I can just hop out and pee in the bushes in the middle of the night when we're at a secluded campsite. 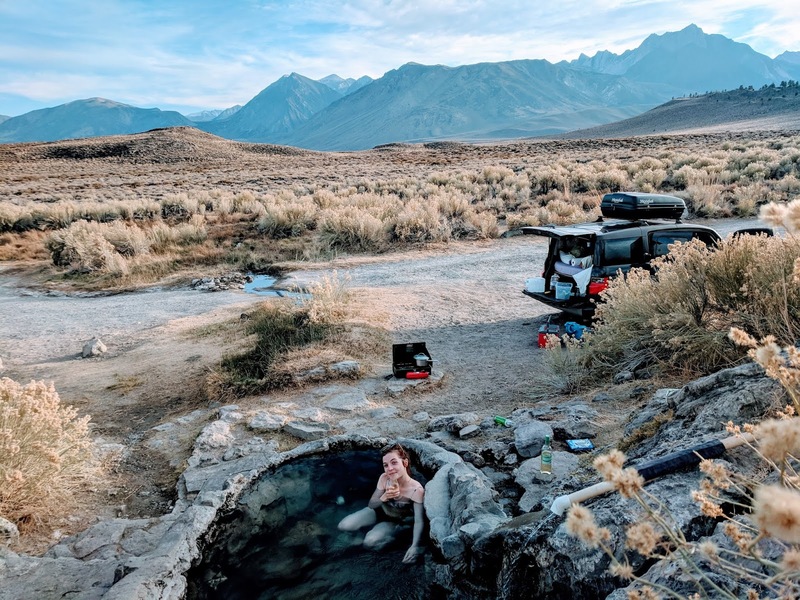 Finding cheap or free campgrounds was also a lot easier than searching for loopholes in local city laws regarding sleeping in your car. Our favorite site to use was Campendium; it was often really easy to search our area and see reviews and pictures of free sites. Andrew would be on the laptop using his phone's hotspot while I drove, and then we would switch at a gas station once he'd found a place because I can't be as trusted to navigate to new places... When we struggled to find something good on Campendium, we had the comfortable knowledge that it's legal to park and sleep on any national forest or BLM land if you're just a little ways off the road. Of course, once you get out of the heavily populated West Coast, more and more Walmarts and casinos allow overnight parking for free, which was nice to have as backup. 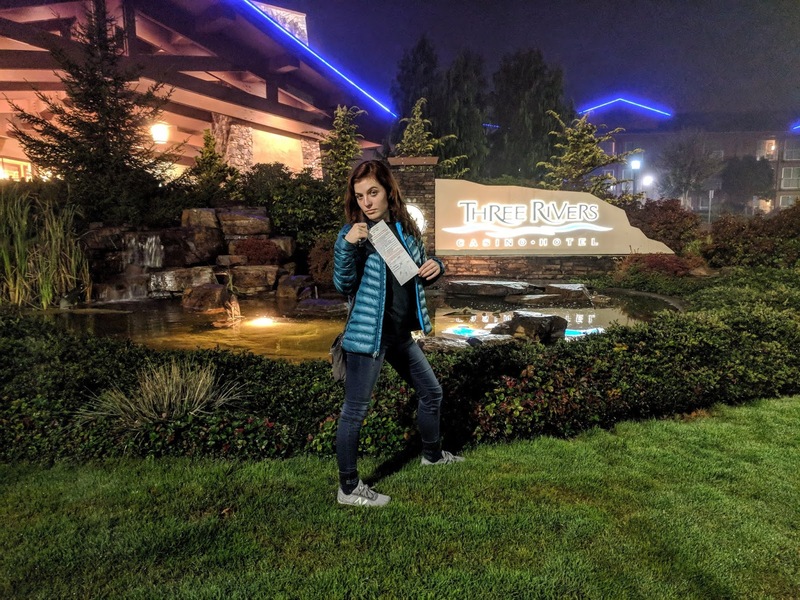 Even in Oregon, when it became clear we weren't going to get as far as we hoped one night, a Three River's Casino close to Highway 101 allowed overnighters. We weren't required to spend any money for the first night, we just had to sign up for a player's card and talk to security. A very grumpy-looking security guard took down our information, gave us a permission slip for our dash, and assured us we'd be safe. After sipping some low-quality cocktails at the casino bar, we spent a warm but very rainy night tucked between a large RV and a similarly outfitted van. The biggest downside there was the bright overhead lights preventing me from discreetly peeing behind the car in the wee hours of the morning. (This was one of the few dark nights we had to use the jar. It was not my favorite solution.) However, once the sun was properly up, we were able to enjoy our morning routine in an actual bathroom with running water, and nobody asked me why I was brushing my teeth and washing my face just a few feet from some slot machines. 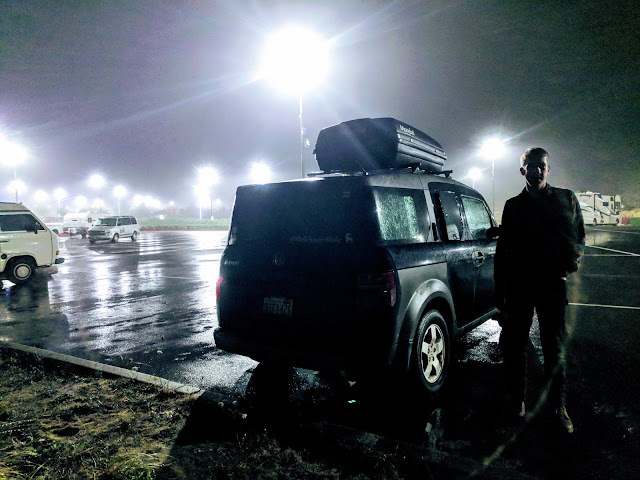 We did park one night at a city park in Junction, Texas, which felt odd (most city parks don't allow sleeping in your car overnight) but there were tons of positive reviews online and a police officer that regularly patrolled at night. If you do your searching, you'll find a variety of camping options out there. Some have toilets nearby and some don't, some offer potable water sources and some don't. Make sure you're prepared and you should be just fine. Without question, we avoided camping inside any national or state parks--with the exception of Clear Lake State Park when we couldn't find another option--because those are certainly expensive. We regularly asked locals for advice, though. You'll recall this is how we found the Merced River, a favorite. This is also how we came upon the Whitmore Hot Springs on the East side of Yosemite, which I will now tell you about--both a park ranger and our friend Dave mentioned them as a dense cluster of naturally-occurring hot springs with free camping right next to them. "Everyone gets their own pool!" both of these gentlemen assured us. We eagerly raced there. The first spring we found was pretty close to the gravel road, and there was a group of several middle-aged men wearing plaid button-down shirts, drinking beers, and driving massive pickup trucks. Before we continued on, assuming the pool was taken, they flagged us down. "We're about to leave!" they said. 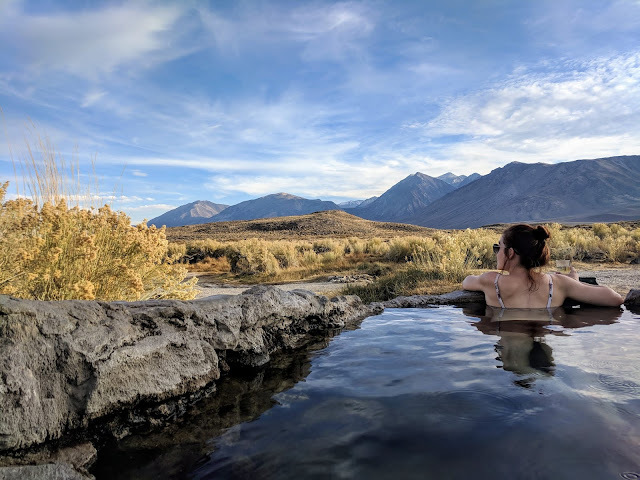 "We're regulars and like to come out and check on the springs, but this one is definitely best for couples and the most private, so you gotta snag it." We did not need to be told twice. We laid out the blanket Nana and Grandad gave us for our wedding like a flag (featuring our names and our wedding date), opened a bottle of bubbly, and ate the lavish dinner Andrew prepared while soaking in the pool. Within minutes of us sighing in contentment and clinking our plastic glasses, a very polite young couple appeared out of the wilderness. "Is this the only hot spring around?" they asked. They, too, carried a paper Trader Joe's bag surely filled with picnic supplies. We tried to be as helpful as possible. "It's the first one we came to, but we hear there are tons around this area. Are you looking for a pool to yourself?" "Not particularly," the boyfriend said, shrugging. "Are you?" "Uh, yes," Andrew said, awkwardly blunt. They wandered away. Only a few minutes later, a middle-aged woman on an ATV--clad entirely in pale pink--came rumbling by. We'd seen a couple ATVs around in the distance for a while, and it became suddenly clear that she was one of them...and they'd been scouting. Maybe ten minutes later, a minivan rolled by. A man in his thirties stepped out, and asked if we were camping here. We nodded. He told us his story, which was that he grew up not far from here and visited frequently as a young boy, but had since moved away for work and family. He was back to visit and wanted to "see if everything was still like he remembered." Eventually he wandered back to his van. The sunset was beginning to look spectacular, and we'd maybe clocked about 30 minutes total in the pool when another young couple approached. 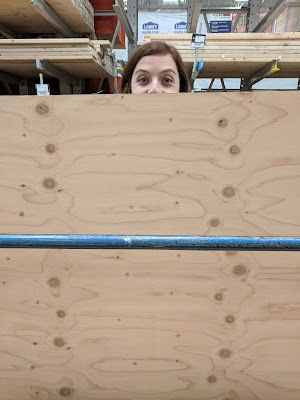 "Think two more can fit in there?" they asked. By this time we were done trying to convince people to leave. Andrew replied, "It will be a squeeze, but if you're up for it..."
They turned out to be great. They were from Australia, and were living out of their small RV on a trip of their own. We chatted for hours and laughed about the ridiculous parts of the US. We tried to convince them that yes, the animals on their continent are far more terrifying than anything on North America. (THEY DON'T BELIEVE US?? BIRD-EATING SPIDERS???) The four of us avoided the chilling night air--and kept the pool occupied in case the ATV people wanted to come and tap in--for hours. Finally we had to face the night and go to bed, and we all pretended to not care about the breeze on our wet skin even though we all probably really cared. They went back to their RV, and we leapt into the cozy blankets of our Element. We never did see the ATV people that night. Now, here's a different story where you can really learn from our mistakes. We were over a month into our trip by the time we meandered over to the Grand Canyon, so we felt we had some experience under our belt. 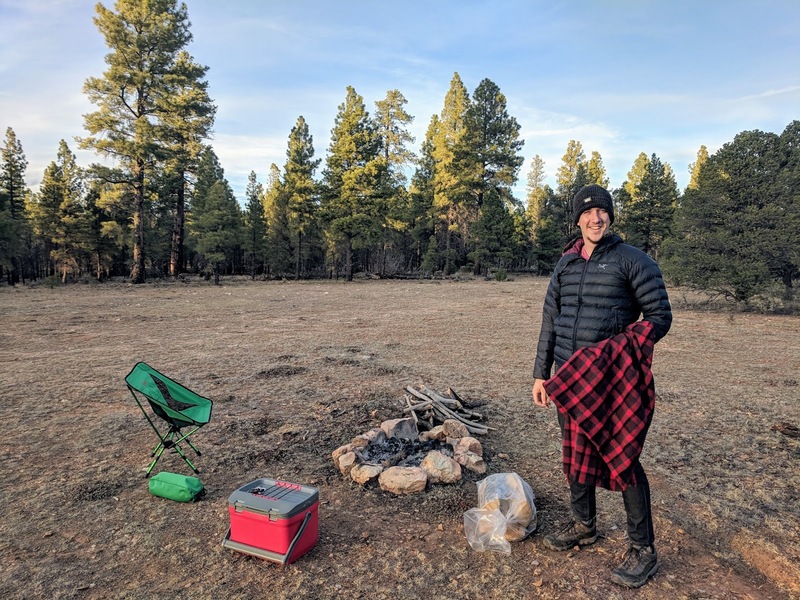 We looked at the weather forecasts ahead of time and thought we'd be totally fine--we had several very warm and cozy sleeping bags, and had frequently been too warm at night thus far. The night at the Whitmore Springs had been very cold, but we were fine. We felt confident. 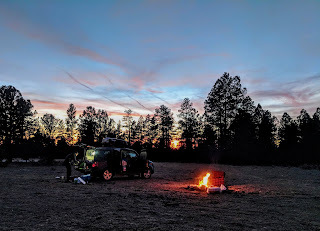 We found a lovely spot off a Kaibab National Forest road just a few miles outside the entrance to the park, situated in a big clearing where we could certainly see stars, and immediately set up a campfire and made some dinner. Of course, we opened a bit of wine to sip, too. We had cell service, so we enjoyed phone calls with our friends and family snuggled up right next to the crackling flames, and before we knew it, two bottles of wine were gone and it was past time to go to bed. 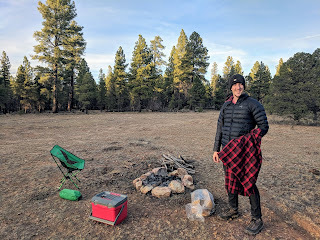 At around three in the morning I woke up to pee, and realized that without the wine in my system and cozy campfire going, it was COLD. SO COLD. Our bodies were quite warm where they were under the blankets, but we had to have our faces out to breathe, and even with our wooly hats on, our noses and cheeks were frozen. Condensation was gathering on all our windows behind the Reflectix and on the moon roof over our heads. Our lungs ached from breathing the cold moisture all night, and our heads ached from all the wine. We huddled together for the remainder of the night. The next day, the morning sun heated our little black car quite quickly. We just stayed in bed until at least ten, and by then the air was warm inside and out. We took a lazy day to recover from our hangovers and lay around in the sun. As the evening crept closer however, my body started to get tired and sore, and my nose a little sniffly. Andrew built me a fire before dark came, but the temperature was dropping even quicker than the night before. He made me some hot tea. We looked at the weather app on our phones, discovered it was going to be nearly ten degrees colder, exchanged worried looks, and started calling hotels nearby. 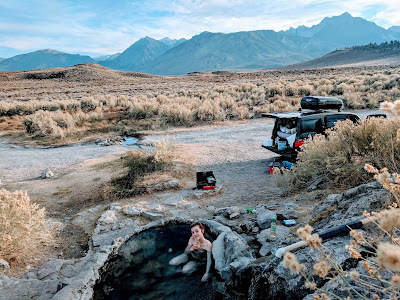 In the end, we have absolutely no regrets about our Element camping experience. 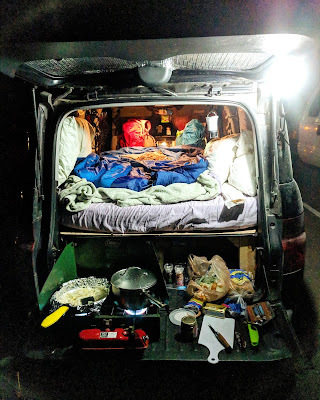 We certainly learned a lot of things, and have enjoyed eager discussions about how we can improve our #vanlife for our next adventure, but this setup was exactly what we needed. We spent maybe $350 on overnight accommodations over the course of the two months. (Staying with family saved our butts a few times, but still.) 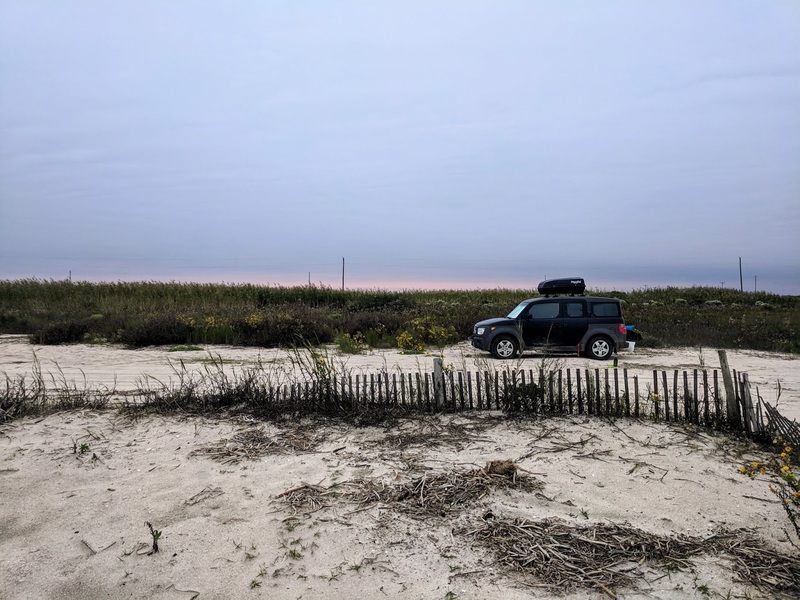 We haven't experienced problems with the vehicle--didn't even get a flat tire--had no medical emergencies (though it got a little close there one night in New Orleans, I managed to keep my finger), and have stayed totally on schedule. Oh, and we don't hate each other, despite living out of a tiny box! Newlywed bliss maybe, or we're just well matched. For now we are at our second-to-last stop on our grand road trip adventure, in Winston-Salem, North Carolina with my aunt and uncle. The Buddy Bus, our wonderful Honda Element, is for sale (with the bed setup, top carrier, and camping supplies included if you want them!) and we are nearly ready to be in New York and then Paris. It feels like we've been road tripping for ages and at the same time, no time at all. 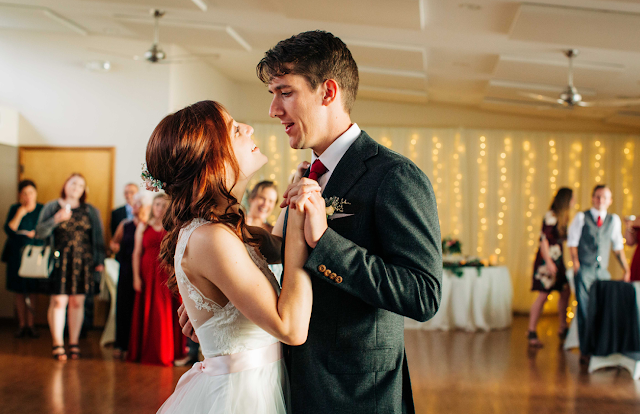 Your a match made in Heaven...I hope you have more exciting adventures in Paris...oh Congratulations Newlyweds.. Thank you so much! We've made it safely to NYC so just one more hop to go :) Best wishes to you!